C. rechenbergi is a species of huntsman spider indigenous to Morocco and can be found in the sand dunes of the Erg Chebbi desert . The spider is named after its discoverer, Ingo Rechenberg, bionics professor at the Technische Universität Berlin. Rechenberg believes he first encountered the spider on a trip to Morocco in 2006, but it was not until 2008 that he collected the first specimen. The discovery of the Moroccan flic-flac spider has influenced biomimetic robot research, inspiring the development of a biomemetic robot based on the rolling spider locomotion. The design process initially involved at least four generations, with the fourth using six legs in three pairs. Rechenberg named the working machine model Tabbot, based on the Berber word "tabacha", meaning spider. 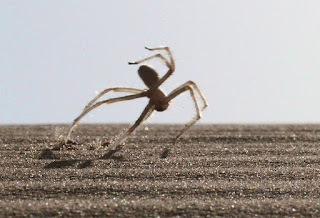 The model, which is approximately 25 cm in length, can both walk in the sand and turn somersaults to move. Rechenberg envisions possible uses for the robot "in agriculture, on the ocean floor, or even on Mars". - Bröhl, Ilona; Judith Jördens (28 April 2014). 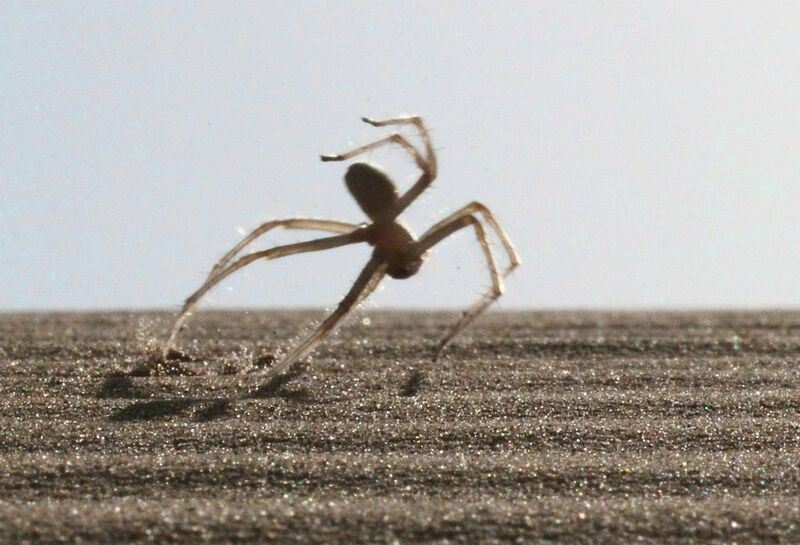 "THE MOROCCAN FLIC-FLAC SPIDER: A GYMNAST AMONG THE ARACHNIDS". Senckenberg Gesellschaft für Naturforschung. Retrieved 23 May 2015. The creature is this video is an amphipod, a type of crustacean with no carapace. It was seen by the NOAA Ship Okeanos Explorer while exploring the waters off Pago Pago, American Samoa. This particular species attacks salps that live in the water using claw-like appendages. Despite their small size, amphipods are sometimes quite frightening to look at, inspiring deep-sea monsters on the silver screen. A new provocative study suggests it was the power of the eyes and not the limbs that first led our ancient aquatic ancestors to make the momentous leap from water to land. According to it, crocodile-like animals first saw easy meals on land and consequently evolved limbs that enabled them to get there, the researchers argue. Neuroscientist and engineer Malcolm A. MacIver of the Northwestern University and evolutionary biologist and paleontologist Lars Schmitz of Claremont McKenna, Scripps and Pitzer colleges studied the fossil record and discovered that eyes nearly tripled in size before and not after the water-to-land transition. This tripling in size coincided with a shift in location of the eyes from the side of the head to the top. The expanded visual range of seeing through air may have eventually led to larger brains in early terrestrial vertebrates and the ability to plan and not merely react, as fish do. "Why did we come up onto land 385 million years ago? We are the first to think that vision might have something to do with it. We found a huge increase in visual capability in vertebrates just before the transition from water to land. Our hypothesis is that maybe it was seeing an unexploited cornucopia of food on land — millipedes, centipedes, spiders and more — that drove evolution to come up with limbs from fins." said MacIver, professor of biomedical engineering and of mechanical engineering in the McCormick School of Engineering. The enlargement of eyes is significant. By just popping those eyes above the water line, the fish could see 70 times farther in air than in water. With the tripling of eye size, the animal’s visually monitored space increased a millionfold. This happened millions of years before fully terrestrial animals existed. "Bigger eyes are almost worthless in water because vision is largely limited to what’s directly in front of the animal. But larger eye size is very valuable when viewing through air. In evolution, it often comes down to a trade-off. Is it worth the metabolic toll to enlarge your eyes? What’s the point? Here we think the point was to be able to search out prey on land." said Schmitz, assistant professor of biology at the W.M. Keck Science Department, a joint program of Claremont McKenna, Scripps and Pitzer colleges. Larger eyes were consequently selected for, whereas the study shows that in water, larger eyes led to negligible increases in visual range. In fact, one animal group that arose after animals came onto land went back to full-time life underwater, and their eyes went back to the smaller eye size normally seen in fish, MacIver and Schmitz found. The massive increase in visual capability enabled by vision in air likely allowed early-limbed animals to evolve more complex cognition. These animals were no longer forced to react with split-second speed as was required by life in the vision-limiting water. Eventually, the researchers said, evolution led to the human capability of prospective cognition: the power to weigh options for the future and to choose strategically. MacIver and Schmitz studied 59 fossil specimens spanning the time before the water-to-land transition, during the transition and after the transition. Their computer simulations of the animals’ visual environments (such as clear or murky water in the daytime or above water in the daytime and the nighttime) show that the benefit of increased eye size would be realized when an animal is seeing through air, not water. The researchers measured the size of each fossil’s orbits, or eye sockets, and head length. From that, they determined the size of the eyes and the size of the animal itself. They found that before the water-to-land transition the average orbit size was 13 millimeters and around the time of transition the average size was 36 millimeters. "The tripling of orbit size took 12 million years. This is the timescale of evolution, which boggles our mind." MacIver said. Through an interdisciplinary approach, MacIver and Schmitz have been able to show that our aquatic ancestors followed an informational zip line provided by long-range vision to an abundance of food on land. Rather than limbs, it was eyes that brought our ancestors to land. The evolution of terrestrial vertebrates, starting around 385 million years ago, is an iconic moment in evolution that brings to mind images of fish transforming into four-legged animals. Here, we show that this radical change in body shape was preceded by an equally dramatic change in sensory abilities akin to transitioning from seeing over short distances in a dense fog to seeing over long distances on a clear day. Measurements of eye sockets and simulations of their evolution show that eyes nearly tripled in size just before vertebrates began living on land. Computational simulations of these animal’s visual ecology show that for viewing objects through water, the increase in eye size provided a negligible increase in performance. However, when viewing objects through air, the increase in eye size provided a large increase in performance. The jump in eye size was, therefore, unlikely to have arisen for seeing through water and instead points to an unexpected hybrid of seeing through air while still primarily inhabiting water. Our results and several anatomical innovations arising at the same time suggest lifestyle similarity to crocodiles. The consequent combination of the increase in eye size and vision through air would have conferred a 1 million-fold increase in the amount of space within which objects could be seen. The “buena vista” hypothesis that our data suggest is that seeing opportunities from afar played a role in the subsequent evolution of fully terrestrial limbs as well as the emergence of elaborated action sequences through planning circuits in the nervous system. True's beaked whales (Mesoplodon mirus) are such an elusive species that it's only now that we finally have the opportunity to see what they look like swimming underwater. Footage released on Tuesday shows the "first underwater video of True's beaked whales." The video comes with a paper published online in the PeerJ journal. True's beaked whales are quite the mystery. They're believed to mostly live in the North Atlantic and there are very few live sightings on record. "The recording of several observations of this species in deep but relatively coastal waters off the Azores and the Canary Islands suggests that these archipelagos may be unique locations to study the behavior of the enigmatic True's beaked whale," the paper says. The video shows a group of three whales gracefully swimming through the blue water. It's a brief glimpse, but you can see the elongated dolphin-like faces that lend them the name "beaked" whales. The species is a deep-diving mammal so rarely seen that it often defies recognition at sea by researchers. As a result, we have very little data about its distribution, abundance and calving rate - information essential for its conservation. Researchers have now found a new coloration pattern in the species and obtained the first images of a calf along with the first underwater video of these whales - helping to reveal the secrets of this species. True's beaked whale (Mesoplodon mirus) is a medium-sized whale in the mesoplodont genus. 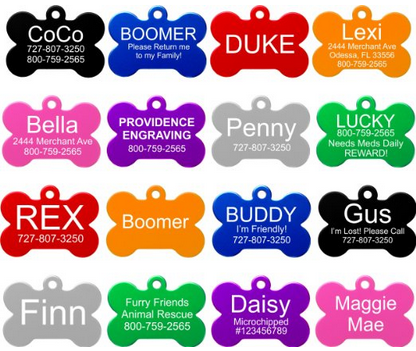 The common name is in reference to Frederick W. True, a curator at the United States National Museum (now the Smithsonian). There are two distinct populations in the Atlantic and Indian Oceans (this species is absent in the tropics) which may be separate subspecies. M. mirus belongs to the family Ziphiidae, the second largest family of cetaceans (which includes whales, dolphins and porpoises), however many of the 22 species of beaked whales are among the least known or understood mammals in the world. This lack of knowledge is highlighted by the fact that three new species of beaked whales have been discovered in just the last two decades. To see beaked whales at sea is such a rare event that many researchers that haved devoted their life to study cetaceans have never seen one. Living in deep waters, usually far offshore, these creatures spend some 92% of their time underwater, invisible to humans. Beaked whales break diving records, feeding at depths that can reach three kilometers and last up to 2 hours. After these diving feats, they rest, performing shorter and shallower dives with brief surfacing intervals. 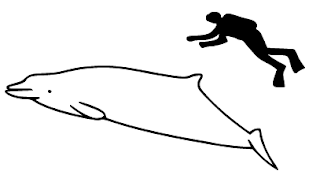 These behaviors, together with the fact that beaked whales live in small groups, are not usually attracted to boats, and do not perform aerial acrobatics as much as dolphins, mean that beaked whales are not easy to detect at sea. Moreover, many beaked whales have variable color patterns that may be shared by other ziphiid species, challenging the identification of beaked whales at the species level during sea encounters, when often only a short glimpse of their body is achieved. 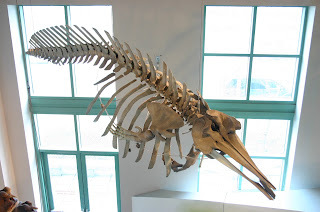 Skeleton of a True's beaked whale at the North Carolina Museum of Natural Sciences in Raleigh, North Carolina. Although True´s beaked whales occur in the North Atlantic and in the Southern Hemisphere, there is a surprisingly large gap in their distribution between these regions. This gap may be real, or might be an artefact of our lack of data. In a paper published today, scientists show that the Azores and to a lesser extent the Canary Islands (areas which represent the southern limit of the known distribution of True´s beaked whales in the North Atlantic) may actually be a hot-spot for the study of True´s beaked whales. The steep bathymetry of these oceanic archipelagos mean that deep waters occur close to shore, facilitating studies of deep-water dwelling species. The study gathered stranding data and sightings performed by scientists, whale watch companies and educational teams in Azores and Canary Islands. These data include the first underwater video of the species and photos of a very young calf, as well as a stranded whale confirmed genetically as a True´s beaked whale but showing a coloration pattern never observed before in this species. These data are highly valuable to learn more about recognizing True´s beaked whales at sea, something which is essential for studies of their distribution and abundance. It is also the first time that this species has been identified with molecular data in this region, allowing definitive links between coloration and species to be made. Beaked whales are vulnerable to human impact: mass strandings occur in relation to naval exercises using intense sonar signals to detect submarines. Also, whales appear on the beach with plastic inside their stomach, entangled in fishing gear or suffering cuts from boat propellers. If these impacts happen offshore and whales don´t reach the beach, we cannot detect them. Accurate species identification therefore allows us to learn more about where animals are and how many they are, information which allows us to monitor the status of the populations and act for their conservation. Bumblebees Learn To Score Goals For Food ! Researchers train bumblebees to move a ball in order to access a sugar solution as a reward. The study, published in the journal Science, suggests that species whose lifestyle demands advanced learning abilities could learn entirely new behaviours if there is ecological pressure. "Our study puts the final nail in the coffin of the idea that small brains constrain insects to have limited behavioural flexibility and only simple learning abilities. "said Prof. Lars Chittka, project supervisor and co-author of the study. Past research has shown that bumblebees can solve a wide range of cognitive tasks, but these tasks were similar to the bees' natural foraging routines, for example pulling strings to obtain food. "We wanted to explore the cognitive limits of bumblebees by testing whether they could use a non-natural object in a task likely never encountered before by any individual in the evolutionary history of bees." said Dr Clint Perry, joint lead author. The experiment required the bees to move a ball to a specified location to obtain a reward of food. The insects were first trained to know the correct location of the ball on a platform. Then, to obtain the reward, they had to move a displaced ball to the specified location. The bees that observed the technique from a live or model demonstrator learned the task more efficiently than those observing a "ghost" demonstration or without demonstration. "The bees solved the task in a different way than what was demonstrated, suggesting that observer bees did not simply copy what they saw, but improved on it. This shows an impressive amount of cognitive flexibility, especially for an insect." said Dr Olli J. Loukola. During the demonstrations, the researchers placed three yellow balls at varying distances from the center. The "demonstrator" bees always moved the furthest ball to the centre, and always from the same spatial location, since they had been trained under conditions where the closer balls were immobile. Untrained bees were given three opportunities to watch a skilled bee perform the task in this manner. In later tests, when these untrained bees were tested without the presence of a skilled demonstrator, bees moved the closest ball instead of the furthest ball, which they had seen the demonstrator moving. Interestingly, in another experiment, the bees also used a differently colored ball than previously encountered. "It may be that bumblebees, along with many other animals, have the cognitive capabilities to solve such complex tasks, but will only do so if environmental pressures are applied to necessitate such behaviors." added Dr Loukola. I wonder what's next? Could a bumblebee learn to play fetch? Probably yes! We explored bees’ behavioral flexibility in a task that required transporting a small ball to a defined location to gain a reward. Bees were pretrained to know the correct location of the ball. Subsequently, to obtain a reward, bees had to move a displaced ball to the defined location. Bees that observed demonstration of the technique from a live or model demonstrator learned the task more efficiently than did bees observing a “ghost” demonstration (ball moved via magnet) or without demonstration. Instead of copying demonstrators moving balls over long distances, observers solved the task more efficiently, using the ball positioned closest to the target, even if it was of a different color than the one previously observed. Such unprecedented cognitive flexibility hints that entirely novel behaviors could emerge relatively swiftly in species whose lifestyle demands advanced learning abilities, should relevant ecological pressures arise.